The Cottage01263 715779work01603 870304fax Self-cateringIn the peaceful, rural location of Ingham, The Cottage is a cosy, single storey dwelling close to The Broads National Park and the wide, sandy beaches of the east coast of Norfolk. The open plan living, kitchen and breakfast area together with a double bedroom and shower room ensure that this traditional cottage provides a comfortable base. Walking, cycling and birdwatching are pursuits that can be taken from the front door! Surrounded by The Broads network there are plenty of ways to experience great days out via canoe, kayak, cruiser or even a traditional Wherry boat. For history buffs Felbrigg Hall, the Blickling Estate and Holkham Hall are all within easy reach, whilst in less than half an hour you can visit the cathedral city of Norwich which offers a diverse selection of shops, restaurants, pubs, cinema and theatres. 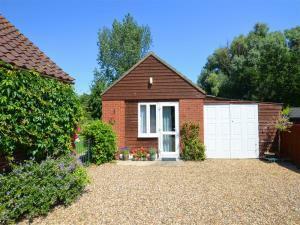 In the peaceful, rural location of Ingham, The Cottage is a cosy, single storey dwelling close to The Broads National Park and the wide, sandy beaches of the east coast of Norfolk. The open plan living, kitchen and breakfast area together with a double bedroom and shower room ensure that this traditional cottage provides a comfortable base. Walking, cycling and birdwatching are pursuits that can be taken from the front door! Surrounded by The Broads network there are plenty of ways to experience great days out via canoe, kayak, cruiser or even a traditional Wherry boat. For history buffs Felbrigg Hall, the Blickling Estate and Holkham Hall are all within easy reach, whilst in less than half an hour you can visit the cathedral city of Norwich which offers a diverse selection of shops, restaurants, pubs, cinema and theatres.